Don Brander: My wife and I headed to the airport just past midnight Saturday night to pick up our 9-year-old grandson Henry, who was arriving on the early morning flight from Toronto. We suspected we might be greeting a very tired little boy who would also be feeling a bit homesick. We were correct on both counts. After collecting his luggage, we arrived at our home at approximately 2 a.m. At that time, Henry realized he had left his cherished teddy bear Sutton on the plane, and the floodgates opened up. Realizing nothing could be done at that time, I decided to head for the airport once the early morning flights had left when the terminal would be a little less hectic. Upon arriving at the Air Canada counter, I was greeted by Merrill Bell, a veteran in the airline industry and someone I recognized from previous visits to the terminal. Upon telling Mr. Bell of my situation, he jumped from his seat and said, “some things you can replace, but a teddy bear isn’t one of them.” He immediately went to the cargo area and after a search of the room, informed me Sutton was nowhere to be seen. He then introduced me to Mark MacDonald, an Air Canada employee responsible for the cargo area. He asked if I could pass along a photo of Sutton. I indicated since this was still early morning it might take a few hours as Henry’s parents live in Toronto. He understood and said in the meantime, he would contact the flight crew since the flight was still in the air heading back to Toronto. I headed home, and shortly after I left, Mr. MacDonald called to say the flight crew did a preliminary search of the area where Henry was seated, but no teddy bear was to be found. He said they would do a much more thorough search once the flight landed. In the meantime, I contacted my daughter, secured a photo and passed it on to Mr. MacDonald. About an hour later, he called a second time, to say the flight had landed, and yes Sutton had been found, and was receiving very good care from the flight crew. They promised to put him on the next flight to Charlottetown, which would be arriving that same morning at 11:30 a.m.
Mr. MacDonald said he would greet Sutton at the gate and call me when he was safely in his office. Henry awoke about the same time that the final call came in to say that Sutton was sitting comfortably in his office. When I told Henry that we had to go to the airport to pick up Sutton, his astonished look and smile told the whole story. His only words were, “You found him!” Arriving at the airport he also got to meet his two new heroes, Mr. Bell and Mr. MacDonald. To say that we were blown away from the response we received from these two gentlemen would be an understatement. 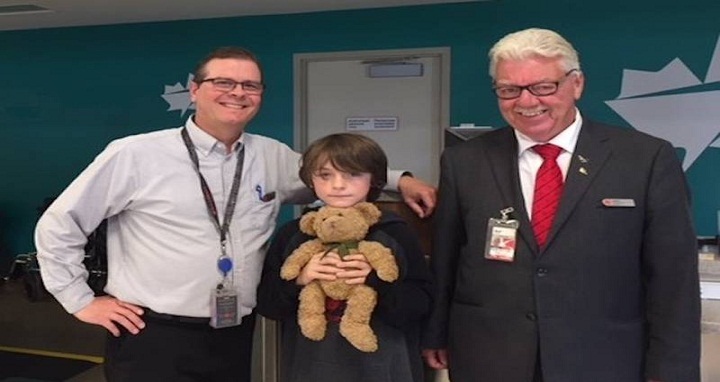 To take the time that they did through what I am sure is a very busy and hectic summer travel period, these two true professionals (as well as the flight crew) got personally involved to reunite a little boy with his beloved teddy bear. A very heartfelt thanks to you all.